Shaheed Bhai Sukhdev Singh Sakheera was born in the house of Sardar Budh Singh and Mata Surjit Kaur. Bhai Sahib had an elder brother, Balbir Singh who became Shaheed in police custody, an elder sister, Dalbir Kaur (whom was married to elder brother of Bhai Anokh Singh Babbar) , a younger sister, Sukhbir Kaur. who was also married, and a younger brother, Waryam Singh who was a farmer. Bhai Sukhdev Singh studied to level 8. 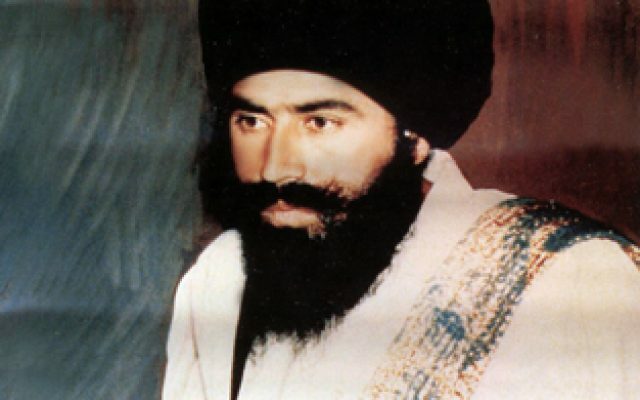 In 1980, Bhai Sahib met Sant Jarnail Singh Bhindrawale , and later took Amrit at Damdami Taksal. He became a close companion of Sant Jarnail Singh Ji. He spent time learning Santhia from the Taksal, and even did seva in the Punj Pyare during Amrit Sanchaars. Bhai Sahib was a man of his word, Whatever he said, he made sure he did. Bhai Sahib would give his head for Sikhi and when necessary would also take heads for Sikhi. When the issue of marriage arose, Bhai sahib would state he is already engaged, death is my marriage, the Government has already arranged my wedding day, when the day comes, I will accept the marriage. After the horrific events of Operation Blue Star, nobody imagined that Sikhs would again be a force and capable of standing up to the Indian Government. However Bhai Sahib in his heart was determined. After 1984, he tried to gather the Singhs still alive to create a movement. He worked tirelessly day and night, and wanted to show the world that Singhs are never intimidated and even if death stands in their way, they will never back down. Singhs can be Shaheed, but they will never give up. Bhai Sahib worked intimately within the Sikh Resistance Movement. When Bhai Sahib did katha his charisma shone, and he influenced many people to take Amrit and share the burden of the Sikh Resistance Movement. After the Shaheedi of Baba Jarnail Singh Bhindrawala, Bhai Sahib was the first to openly speak on stage asking youth to take Amrit and fight the Government, as such he became very dangerous to the authorities, who made his elimination a high priority. The Punjab Police put a reward up for the head of Bhai Sukhdev Singh Ji. So Bhai Sahib went underground and joined the ranks of Baba Manochahal, Jathedar Sukhdev Singh Babbar, Bhai Anokh Singh Babbar, Shaheed Bhai Manbeer Singh Chaheru, Bhai Tarsem Singh Kuhar, Bhai Dhaana Singh, Bhai Avtar Singh Brahma, Bhai Durga Singh Arfuke, Bhai Kuldip Singh Muchal, Bhai Gurdev Singh Usmanwale and many other Singhs who now operated underground, working for the establishment of the Free Sikh Raj. The Politics of the time were dominated by Longowal, Badal, Tohra, Talwandi, and Barnala. They all were all of a very dubious nature, and only played self-interest politics. The youth desperate to get rid of these characters set up a new Akali Dal. Simranjit Singh Mann was selected as its first President, and its acting Presidentship was given to Bapu Joginder Singh, father of Sant Jarnail Singh Bhindrawale. Senior Sikh leaders pledged support for this new party including Jathedar Ujjagar Singh Sekwon, Ranjit Singh Brahmpura, Jathedar Soorat Singh, Charanjit Singh Walia, Jagjit Singh Rode, Jathedar Jagdev Singh Koodian (Shaheed MP) and Sikh Students President Manjit Singh and General Secretary Harminder Singh Sandhu, who was in Jodhpur Jail at that time. Parcharaks such as Amrik Singh Mukhtsar joined them and Bapu Joginder Singh started doing large conferences in Punjab with Amrit Sanchaars, and speeches about the Sikh Movement. The person who brought all of these people together and organised it was Sukhdev Singh Sakheera. After Operation Blue Star, a Shaheedi smagam was held at Chowk Mehta, where the families of Shaheeds were honoured. After listening to the speeches, a five-member Panthic Committee was selected. The vision of Sardar Dalbir Singh, the wisdom of Sardar Kapur Singh, and influence of Dr Sohan Singh led to this happening. Baba Gurbachan Singh Manochahal was announced as Jathedar of Akal Takhat Sahib. This led to old traditions being brought forward such as the Sarbat Khalsa. Bhai Sahib was staying with Baba Manochahal in village Manochahal, where both escaped from after being surrounded by Police. To attend the Sarbat Khalsa both had to escape from many Police encounters. Sikhs started to get confidence again and awareness spread. At this time, a controversial subject in the Panth became the erection of the Sri Akal Takhat Sahib, which was devastated by tanks and a helicopter gunship in 1984. Indira Gandhi and her stooge Santa Singh Nihang, using cheap labour from Bihar, and government money erected the building. However the Sikh sangat wished to tear it down and rebuild it by Sikh hands, paid for by Sikh money. The SGPC were not giving them permission to do this. The Sikh Students Federation, Damdami Taksal, Babbar Khalsa, Khalistan Liberation Force and other Jathebandi’s were all in favour of even giving sacrifices to ensure that Indira Gandhi and Santa Nihang`s building is rejected and Sikh sponsored Kar Seva began. Bhai Sukhdev Singh was also in favour of this and wanted to resolve the issue in the proper manner. The Damdami Taksal and Sikh Student Federation announced they had received letters from the Worldwide Sangat on this matter, and on 26th January 1986 a Sarbat Khalsa was held to start the Kar Seva for a new Sri Akal Takhat Sahib. Masses of Guru Nanak Dev Ji’s followers attended the event. The SGPC were stuck, on one side was slapped down by Delhi Government, and on the other side Sikh youth were determined to get their way. Seeing the enthusiasm in the Sikh Sangat for demolishing the Indira Gandhi/Santa Nihang erection, the Head Granthi of Sri Harmandar Sahib arranged a secret meeting between the SGPC and the Damdami Taksal and other Jujarhroo youth at Gurdwara Bir Baba Buddha Sahib. Baba Kharak Singh Kar Seva Wale also attended with Bhai Sukhdev Singh Sakheera and his companions. Both sides gave their viewpoints, and Baba Kharak Singh sided with Bhai Sukhdev Singh. Bhai Sahib’s voice was highly influential and the Kar Seva began demolishing the Indian Government erected building with the Resolution passed in the 26th January 1986 Sarbat Khalsa. At that time, there was a Nihang called Kahn Singh Baggi, who had taken over Gurdwara Khadur Sahib. He was associated with the Tarna Dal group of Baba Bishan Singh from Baba Bakala. He treated Sikhs very arrogantly, and many Sikh sangat were very unhappy with his anti-Sikh activities at the historic Gurdwara. As a result, the attendance at the Gurdwara dropped, resulting in less churava (golak money) for him. At a large meeting of Sikhs, Nihang Kahn Singh vehemently and abusively spoke against Sant Jarnail Singh Bhindrawale. Bhai Sukhdev Singh could not tolerate this, and said “your men are gangsters and doing wrong, and you have the nerve to blame Mahapursh Sant Jarnail Singh for you dwindling sangat. You should think before you speak!” However Kahn Singh was influenced by no-one, and said whatever came to his mouth without thinking. Bhai Sahib knew now was not the time, and he could not do anything. However some time later, outside Punjab at Hola Mohalla celebrations, Nihang Kahn Singh was shot dead, by a Singh who escaped shouting “Sant Jarnail Singh Jindabad!” Bhai Sukhdev Singh Sakheera is credited with this action. In May 1986, a meeting happened between Bhai Sukhdev Singh and Baba Amrik Singh at Gurdwara Shaheed Baba Deep Singh, Amritsar. After the meeting, as they left the Gurdwara, two men in Sikhi disguise approached. As one bowed to say “Fateh” to Bhai sahib, the other shot Bhai Sahib at point blank range, then both jumped in a jeep and sped off. The news of Bhai Sahibs Shaheedi spread throughout the Panth like wild-fire. Every Sikh felt that their son Sakheera had passed away before his time. Another talented young Sikh had been lost in the typhoon of the Sikh Movement. When Bapu Joginder Singh, father of Sant Jarnail Singh ji, heard the news, he went silent, and then said “my General Sakheera has left us.” Then tears dropped from his eyes. Bapu Joginder Singh had lost 6 sons and grandsons in Operation Bluestar, but never cried. But when Bhai Sukhdev Singh was Shaheed, he cried. Bapu Joginder Singh was doing a series of Amrit Sanchaars smagams, but straight away left with his Singhs for Amritsar. Baba Thakur Singh, head of Damdami Taksal also reached Amritsar after hearing the news. So did Bhai Sahib’s father, Bapu Budh Singh and many of his village folk. Plus many Jujharoo Singhs who were underground also attended Amritsar. Bhai Sahib’s body was taken to village Sakheera. The village Sarpanch Sardar Karaj Singh, said “Bhai Sukhdev Singh met me a few days ago. He said I will be a Shaheed soon. Take my body for cremation to Gurdwara MaaeDass. Sit in the Gurdwara and enjoy the bliss of Gurbani.” Bhai Sahib’s cremation happened at Gurdwara MaaeDass. As well as Bapu Joginder Singh, Baba Thakur Singh, thousands of Sikhs attended the cremation in 1986, and shared the loss of a diamond of the Sikh Nation.